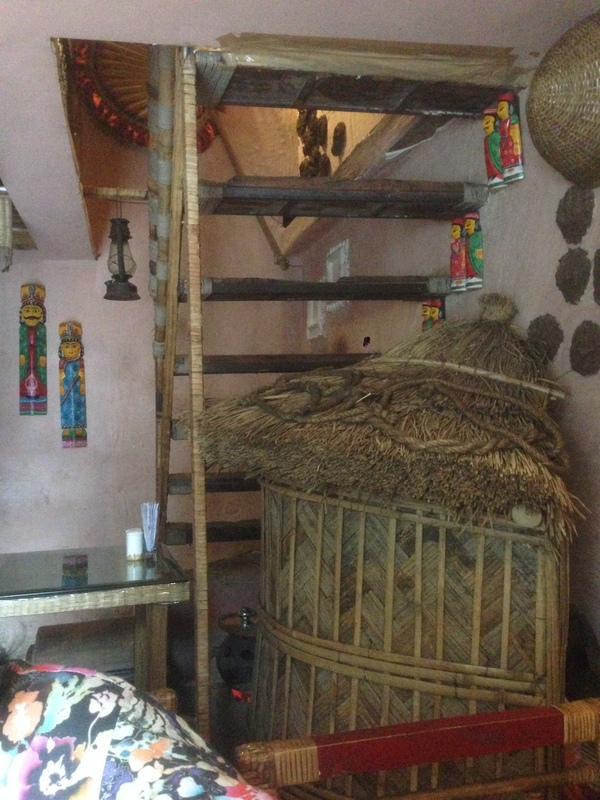 Nice café Décor, good behaved but not effective waiting staff, almost as good Bengali food as Oh Calcutta at 1/3 the price. I heard about this place from a colleague of mine. 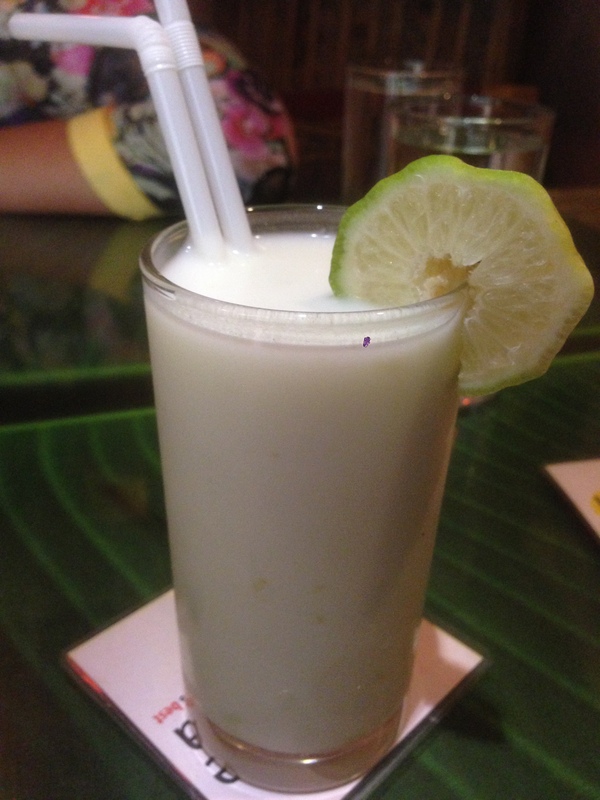 She raved about it & said ‘If u have not tried this, u have missed something’. 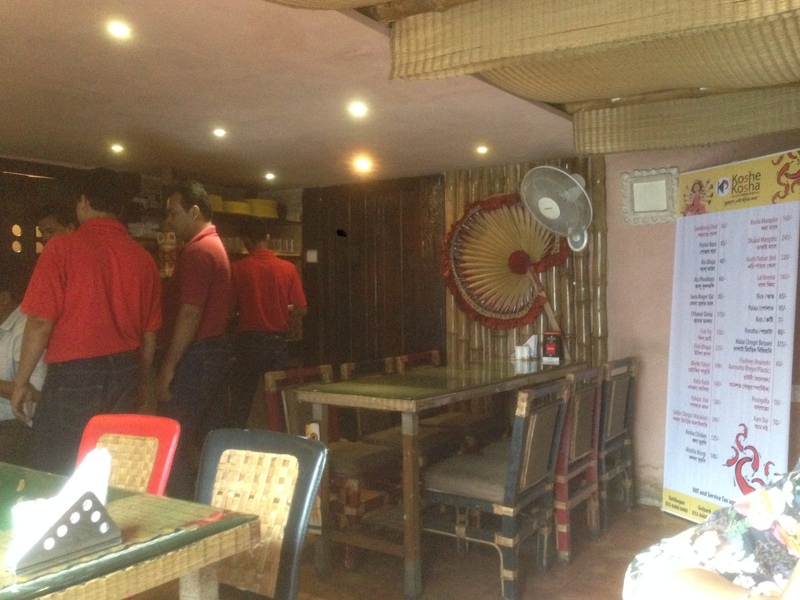 SO we decided to try this place out on our next visit to Kolkata. Koshe Kosha is a smart tweak to a bengali term Kosha which means ‘to cook spices & meats together for a long time together. 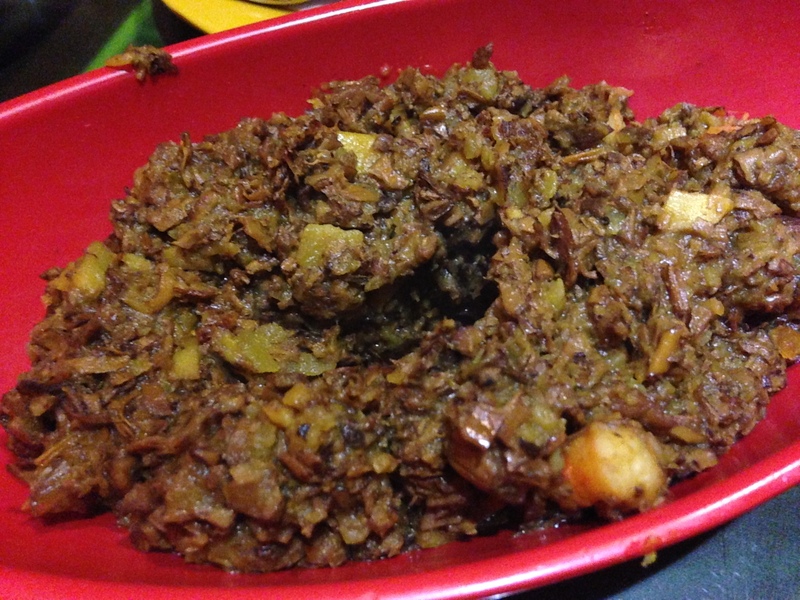 Kosha Mangsho is one such example. The restaurant is small but very beauifully done up. 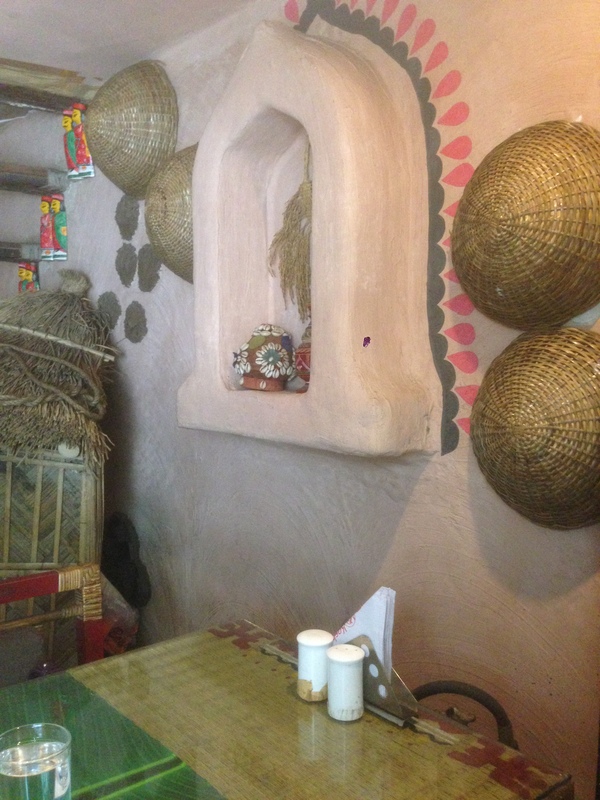 Theme of décor was rural Bengal. A wooden staircase takes one up to the 1st floor which has a seating area as well. The samll restaurant has very strong air conditioning & at times one needs to request to put the A/C off. They seem to have a problem with surya devta (sun god) – So in the peak of the Day they had pulled the blinds down & it was pitch dark inside illuminated at places by low voltage bulbs. 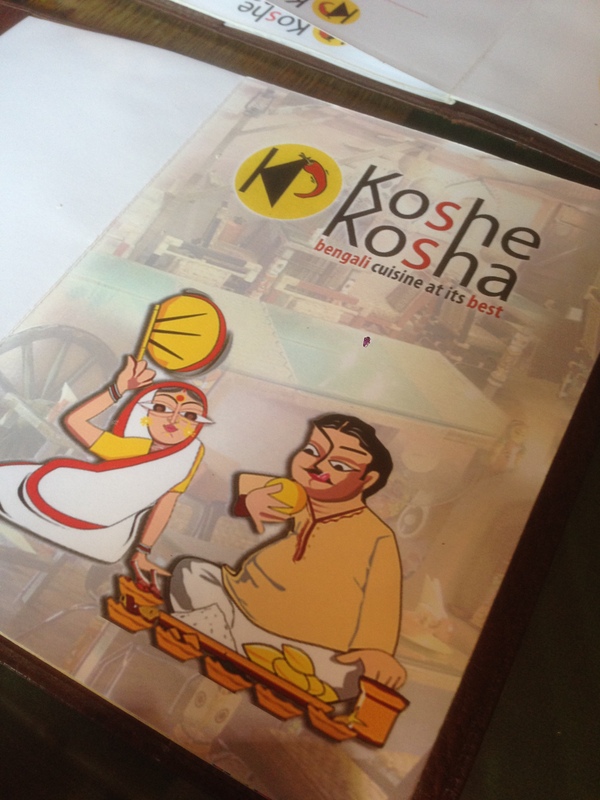 Menu card is very nicely done – short descriptions of the dishes with Bangla names. For those who understand Bangla, there were a few funny category headers as well. The waiting staff were very well behaved & they tried to be helpful. I said ‘tried’ coz they cud not help themselves being helpful. We ordered quite a few dishes & specifically asked the guys to serve them one by one. They just got all 4 of them together. That was the most irritating point of my being in the restaurant that day. The waiting staff actually came up to us with a bottle of Hand sanitizer & gave us the option to clean the hands before eating. Fnger bowl at the end of the meal is common in most places but this one was quite new to me. Food was awesome. 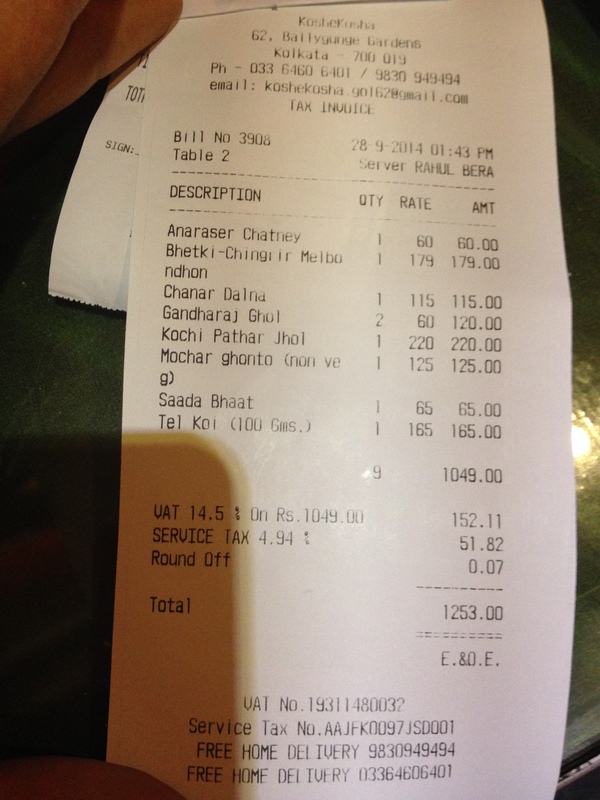 Almost as good as / as good as Oh Calcutta at 1/3 the price. Some dishes were exactly as good. 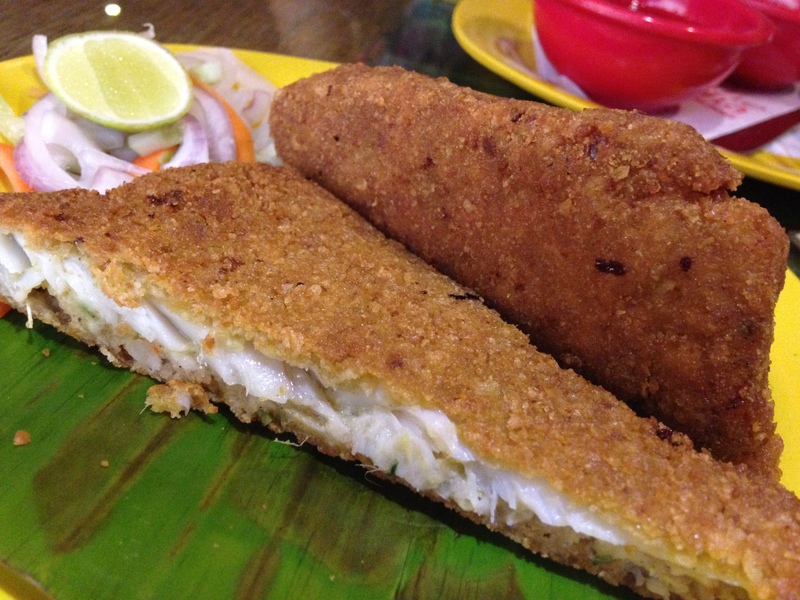 Bhetki Chingri melbondhon – a bread crumb coated bhetki and prawn filling cutlet. Awesome is an understatement. 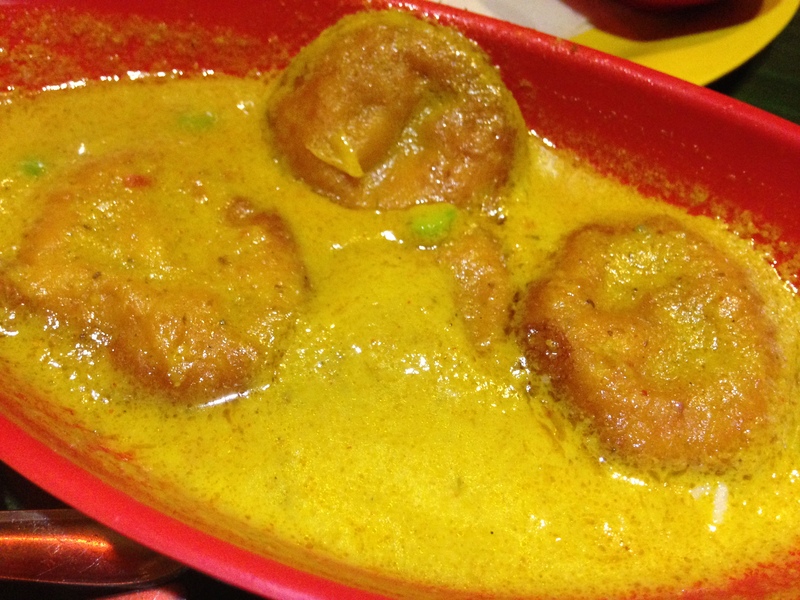 It is not in main menu but was there in pujo special menu. The inside of the ctlet had a thick slice of bhetki topped with prawns. Outside was bread crumb layer. The cutlet was Juicccy inside, crisp outside, outstanding to taste & had perfect flavours of both the fish & the prawns – the melbondhon (amalgamaton) of flavors happened beautifully. Unbelievably good. Rate it 4.75/5. For main course we ordered Mocha Chingri. It was banana flower cooked with prawns. Yes, u read it right – Banana flower (called Mocha in bangla). If banana has a fruit, there must have been a flower – this is that flower. Excellent flavors of mocha, spices & that of prawns came together. The mocha was of good quality & had a mild sweetish tinge. The prawns were fresh & succulent. Wah wah. Rate this dish 4.5/5 again. 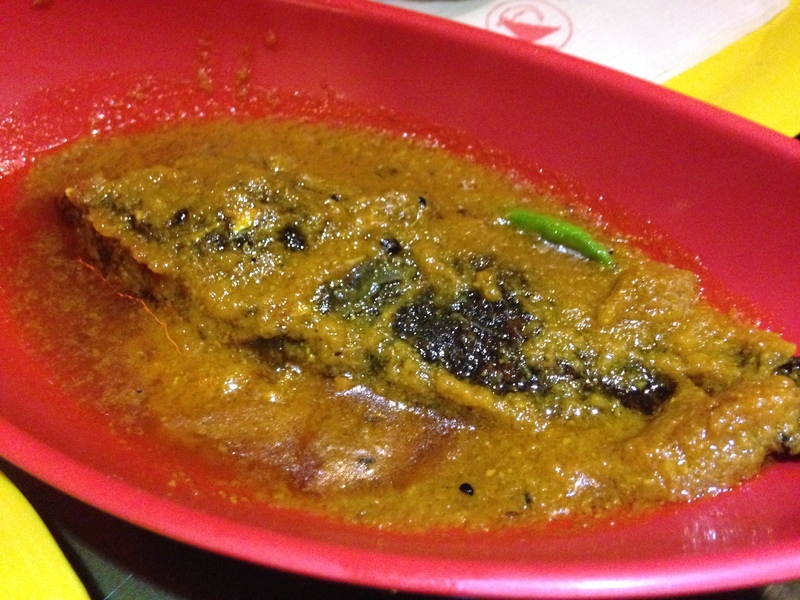 Last dish in main course was Kochi pathar jhol – Kochi means small (in this context), patha means goat & jhol means thin gravy. 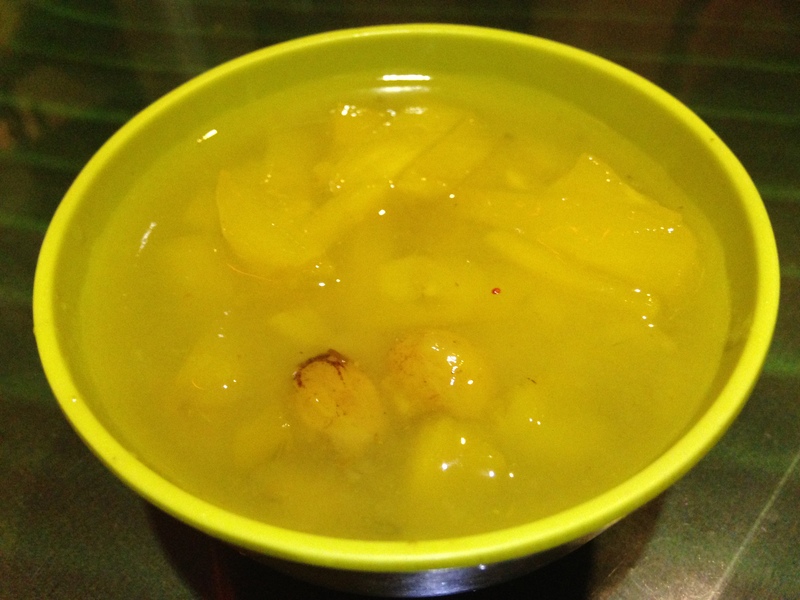 This is a Sunday lunch staple in many bengali homes. Simple jhol with small goat. 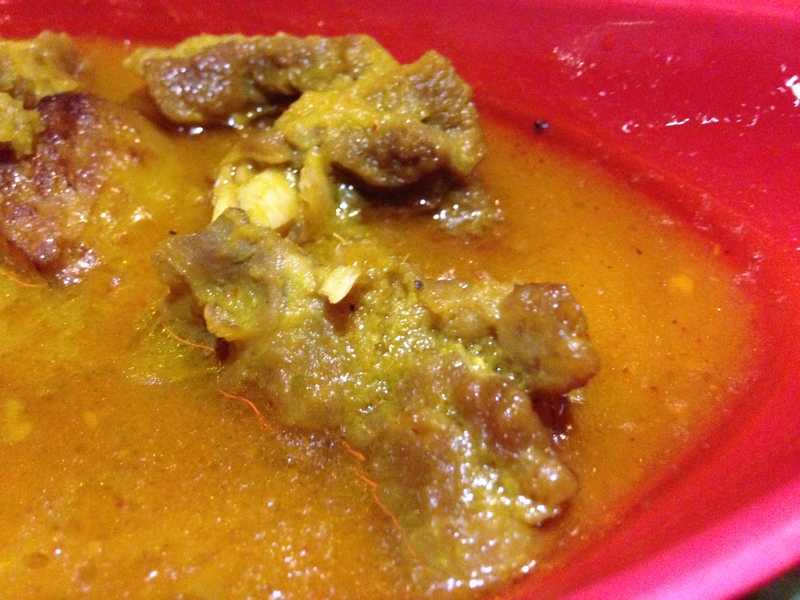 The gravy was full of flavors of masalas & also the goat meat. Wah. Rate it 4.5/5 again. For dessert we tried Pineapple chutney. This was the only place where the food fell from my expectations. The chutney was unidirectionally sweet. A bit of salt wud have balanced it out better. We asked for slice of lemon, sprinkled salt & then suddenly the chutney sprang back to life – as drastic as Jassi (in the hindi serial named Jassi jaisa koi nahi). Rate it 2/5 as it is & 3.5/5 after we did what we did. Average rating of chutney is 3.25/5. 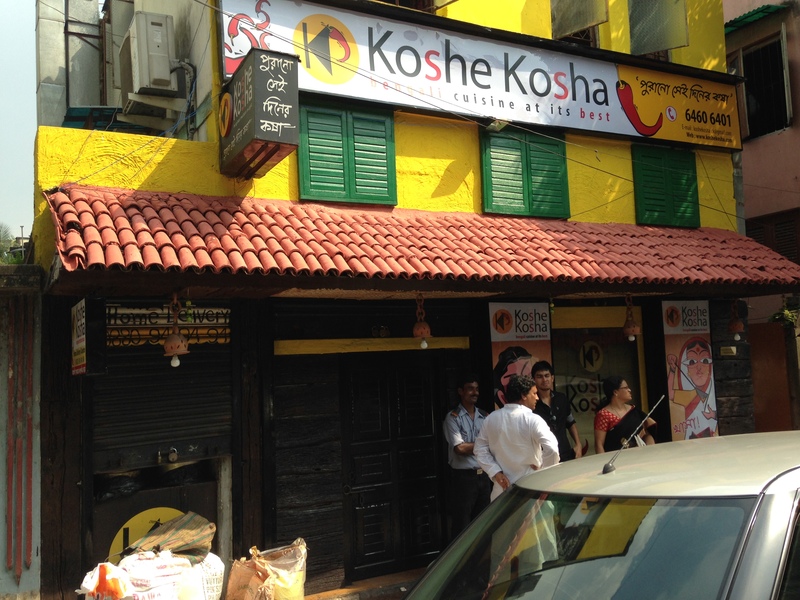 Overall rating of food & beverages at Koshe Kosha averages out to 4.3/5. I wud surely revisit to try out the numerous other dishes here. Look forward. 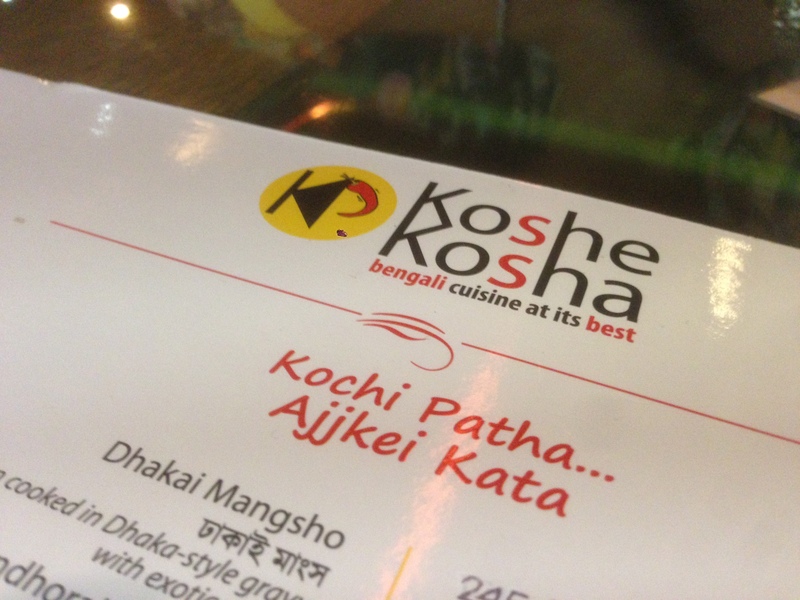 I have also tried their mutton Koshe Kasha Mangsho from their Rajarhat outlet. It was very good but for Kosha Mangsho I guess little more chilli was required to it become optimally hot.